A stunning ring in an oxidised finish handmade in 925 silver with filigree work. 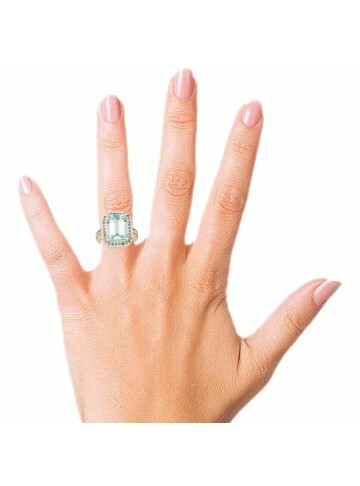 Truly a stunner, this ring is evergreen and can be worn anytime at any age. The ring was created for our Prism collection to give you the feeling of royalty. Also, available in gold plated silver, this can be matched with any outfit for an evening out. Gold plated disc ring with tiny Rubies to complete your cocktail look. If you like to be funky and different, this silver snake ring with a carnelian orange stone is for you. 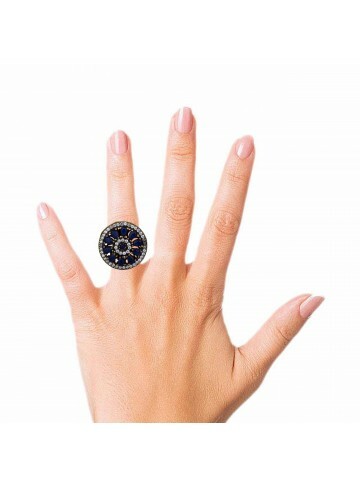 A nice statement like band ring with blue enamel work and a black floral designs. You will enjoy wearing this meenakari ring! A nice band ring handmade in silver and gold plated with white enamel. The turquoise stones on top and zircons adds to its brilliance. One of its kind, this ring only belongs to a few of you. A lovely combination of white and black enamel with a touch of pink with sapphire stones. Handmade in silver and plated in gold, this ring is definitely something you should own. A skyblue enamel disc is placed on a gold plated silver band ring giving it a nice funky style. A funky circular enamel disc ring in gold plated silver gives you a nice trendy look when worn. A statement ring inspired by ancient Egyptian Applique designs with lapis and turquoise stones. The ring is uniquely designed with two pieces joined together. A statement ring to own for sure! All designs in our collection have been inspired from Ancient Egypt and combined with modern motifs giving it a contemporary appeal. A statement ring in a double style with turquoise and lapiz enamel work, handcrafted in 925 silver and gold plated to give you that edgy look. The beaded chain with turquoise and lapis stones gives it a nice funky style. Truly a masterpiece! All designs in our collection have been inspired from Ancient Egypt and combined with modern motifs giving it a contemporary appeal. A beautiful ruby is set in this ring with white enamel work and handwork in silver plated in gold. A stunning piece to own! A lovely ruby is set in the center of this gold plated silver ring with enamel work on the rim. Truly a masterpiece! A dazzling smoky topaz stone surrounded by scintillating citrine stones for a cocktail look. Gift it to your loved one and make her day! A huge disc ring with leaf shaped zircons on a gold plated silver mesh for a statement look. Wear it to get noticed! If you're looking for the perfect ring in blue, you cannot go wrong with this blue topaz ring in sterling silver. Two flowers made with peridot stones are are placed beautifully in this zircon ring. Make a statement with this flashy ring! Gold plated disc ring with tiny sapphires to complete your cocktail look. An antique finish silver cocktail ring with a rugged look. Perfect for a casual Sunday brunch! This classy silver ring is embellished with contemporary branch patterns that will instantly become your favourite statement accessory! The different copper tone on the shiny golden base will instantly brighten your hands. Style Tip: Wear it to an event or a party with a nice pair of earrings. Studded Rubies, Black and gold rhodium plating in an oval shaped cocktail ring for that perfect dressy look. A leaf shape cocktail ring with a tinch of gold, surrounded by round crystails and polki on all sides. This ring is perfect for your dinner date! This mango shaped, enameled, cocktail ring with zircon stones is traditional yet striking. Wear it just by itself with your favorite Western or Indian outfit and make a statement..